It's been really long when I had my June,12' HAUL in which I bought few beauties from BeautyUK of one which was this Pink striped Blusher. Has it been a HIT or a MISS in my stash? To Know More Read More!!! 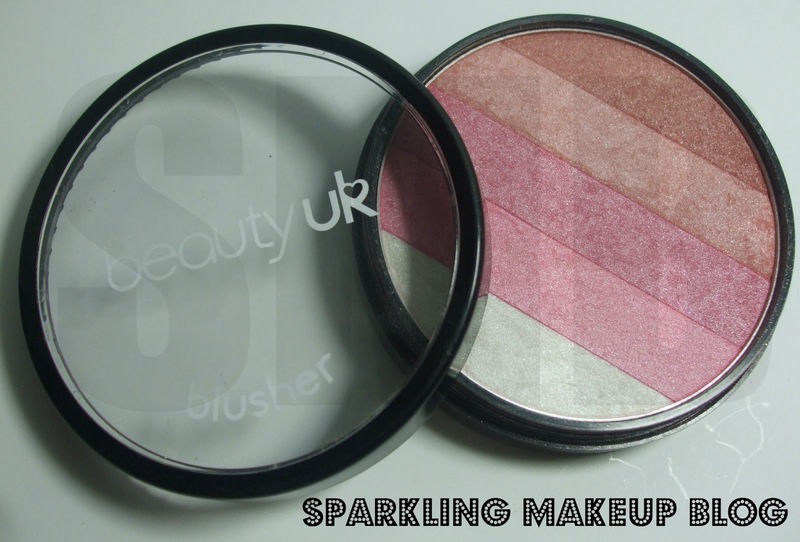 This ever popular striped blusher in pink gives your skin a healthy shimmering glow. Use the lighter shades as a highlighter and build the colour to suit your desired look. It is a Black Plastic packaging with a transparent lid, the rims are black too. It has a screw-open lid. 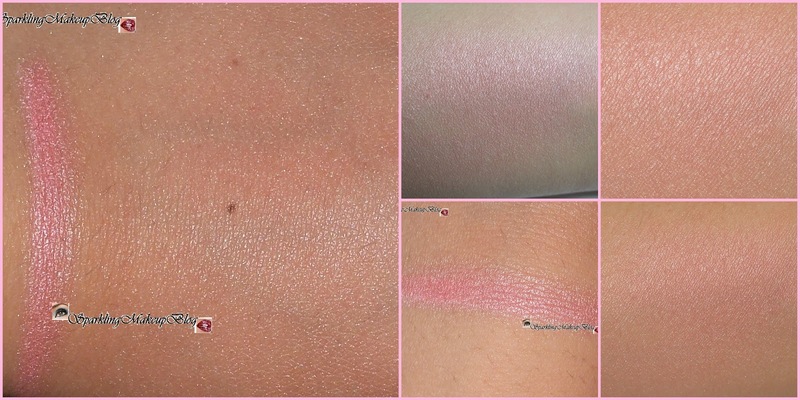 The Blusher shades are in strips from dark to light. Pink blusher was missing in my stash I was looking for a one that can serve my need of PINK & SHIMMER at the same time. I spotted it and bought in my June,12' HAUL from Just4girls. To tell you the truth I didn't regret the purchase:) I fell in love with this one. The pigmentation is really good gives you a full colour pay-off, and the powder is well-pressed in the pan, you know what I mean? NO POWDERY FALL OUTS at all. The formula is really fine and it feels more softer than even a powder. It is one's own choice to use the darker strips or the lighter ones for highlighting, individually, or just swap the blush brush all over the strips and get a unique Pink shimmery/glowing blush every time. I usually mix all the strips to make a healthy shimmery pink glow for my cheeks every time. The only uncomfortable part for me is the screw-open cap/lid, that is not helpful in quick make overs. I personally prefer click-open lids they are less messy and provide one a total freedom of being a little careless in handling the packaging, like you just click the lid lock and put it any where until you return back home:) It CAN BE used as an eye shadow esp the lighter shade for highlighting the brow bones. 4.5/5. The half point is cut for the screw cap lid that's not comfortable for the usage in a hurry or on-the-go. Pkr. 495. I bought it last year June from Just4girls.pk. They have all range of Beauty UK on board. Do join Beauty UK on Facebook to stay updated on what new and the latest trends. I hope you all like this post and would give this striped blusher a try. don't forget to comment, like, tweet, share,G+ and Pin it. Do have a look on my other review posts on BEAUTY UK Here!!! 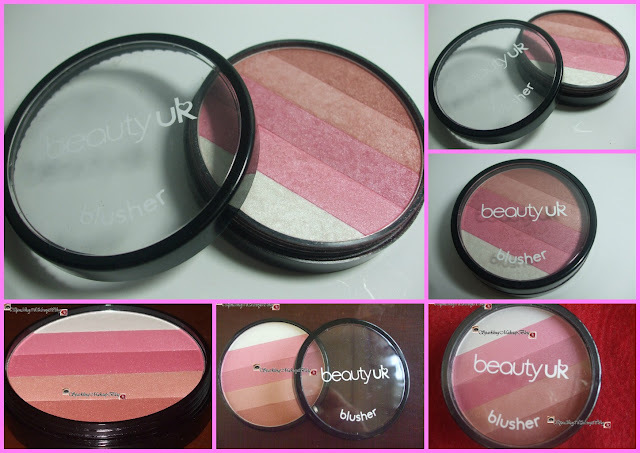 Do have a look on my other review posts on Blusher/Blush-ons Here!! !